So hey! Is it your birthday? Is it your birthday tomorrow? Next week? Last week? Are you due a birthday soon? Have you had a birthday some time in the last year? Awesome! 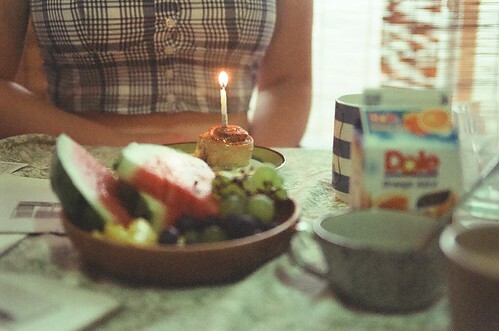 Let's do a birthday breakfast. 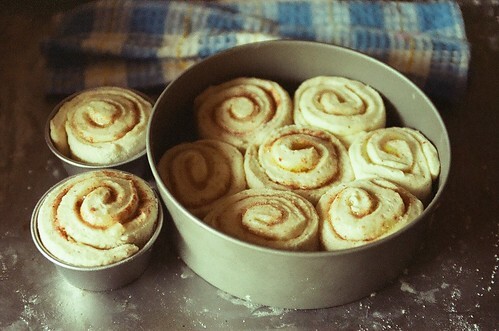 Cinnamon rolls are a cold weather thing. Sorry if I just crushed all your dreams then. Sorry if you're eating cinnamon rolls right now in the blistering heat while you pull strips of peeling skin off your legs, which is incredibly satisfying and should only be done in front of people who love and accept you (the skin peeling, not the eating. You can eat cinnamon rolls in front of people who don't love and accept you. 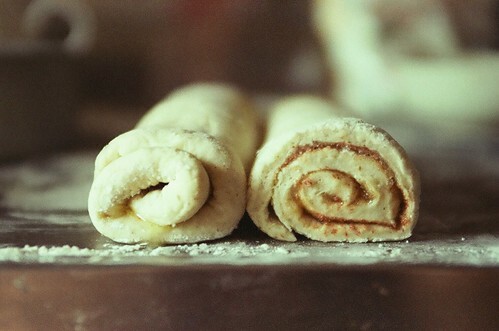 Actually, if that's the case, I kind of advise you to eat cinnamon rolls. Make a point of it! Make lots of loud MMMMMing noises and waft the smell around, and don't offer them a single bite. You gotta earn yo' breakfast around here). It's the cinnamon, you know? 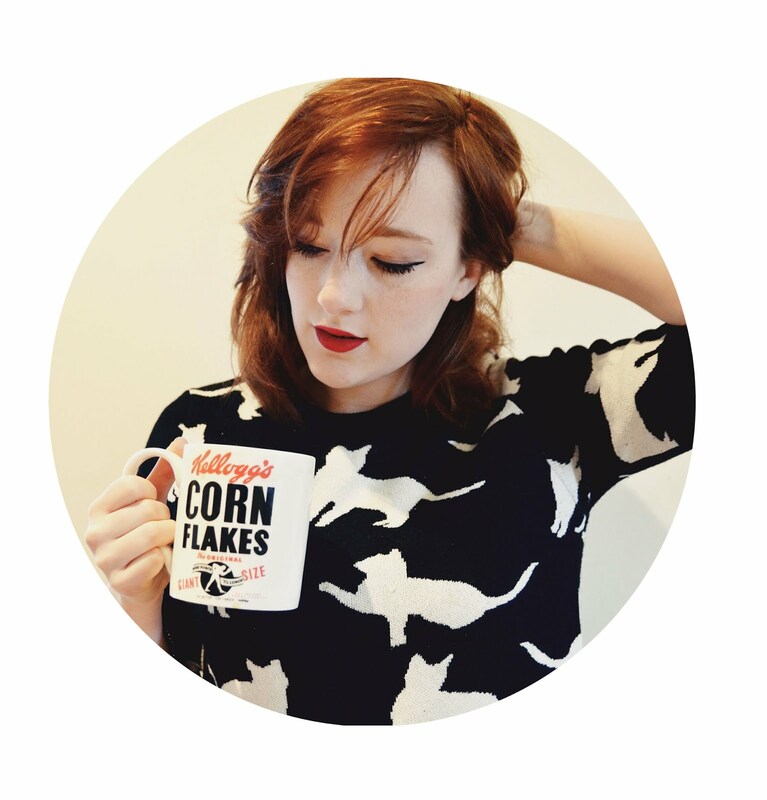 Cinnamon means Autumn, that's the sort of rule they teach us at blogging school. You think I just make this stuff up as I go along? You think I'm just typing out my train of thought here? The good news is, the cinnamon part isn't compulsory. If you've been living in Japan for a year, and your friend is coming over for a couple of weeks, and it's her birthday, and you're trying to distract her from the fact that you haven't vacuumed; or if you just like breakfast and putting candles in things for no real reason; or if you're allergic to the colour brown and feel that sweet rolls could be so much better if there were more pink involved - maybe you would like vegan sakura sticky rolls, sprinkled with cherry blossom powder and pale pink sugar. If cherry blossom powder isn't plausible for you, you could use this recipe to make vegan cinnamon rolls, and I won't, you know, judge you. You could substitute a filling of rose petal jam, or pb&j, or whatever flavoured sugar you fancy. I'm thinking about snipping open an earl grey teabag or two and making a sweet tea flavoured sticky roll, because I'm constantly on the lookout for more efficient ways to caffeinate myself in the morning. Also because that sounds delicious. The point is, this is an example - a starting point - and for the record, it was also freaking fabulous. Let the record also show that as of last Thursday, I turned twenty-two. I reserve the right to strike that from the record in future whenever I decide to start lying about my age. What kind of time should I start doing that? 1. Combine soy milk and coconut oil and microwave for 30 seconds or so, until warm and fully melted. Make up your flax egg by combining the flax and water and heating gently until it goes gloopy, the texture of an egg white, then add half of the plain flour and all of the sugar, flax egg, yeast and salt to the milk and oil mixture. Beat in thoroughly, then add the rest of the flour until it's all absorbed. If the mixture is too sticky, add a little more flour, a tablespoon at a time. 2. Turn the dough out onto a floured work surface and knead it until smooth and elastic - by hand, about ten minutes. Form into a ball, then put in an oiled bowl and cover with cling film, and leave it to rise in a warm place until doubled in size - up to two hours. 3. Mix together the sugar and whatever flavouring you're using. 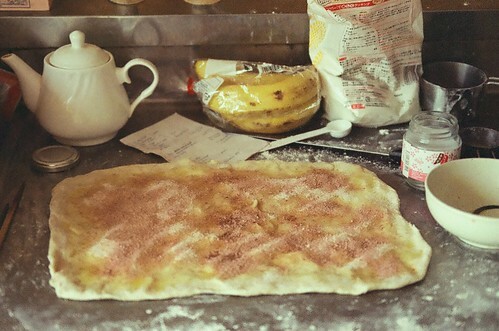 Punch down the risen dough, and roll it out into a long rectangle - about 15x11". Pour the melted margarine over it as evenly as you can, then sprinkle the flavoured sugar on top. Okay, yum. Roll into a log, starting at the long side, and cut into nine even slices (with the seam facing down, to avoid them unravelling). Arrange in a 9" dish, and leave to rise for another 40 mins, until they're all nestled in together like the second photo above. 4. Bake at 190C for 20 minutes, until tops are golden, then allow to cool slightly. 5. For the glaze: mix all of that good stuff together and eat it. Make another batch. You might want to make a double batch in the first place to account for this. Pour aaall over yo' rolls. Just up all over them. PS, guys! Thank you for your lovely comments about Ryoma. He is settling in beautifully, spends most of his time demanding cuddles, and may have prompted me to google, "is my cat supposed to be this lazy?". We are obviously kindred spirits. Best. Birthday. Breakfast. Ever. Will demand my mother bake them for me next year. Assuming I am in alderley which I don't intend to be. Give Ryo big cuddle from me I miss him. I love the story about Ryoma. He sounds like such a sweet kitty and I'm so glad you took him home with you! The rolls look amazing, a perfect birthday breakfast. I've never seen cherry blossom powder but I've been looking for ways to use tea in cooking and baking so I'd love to try the earl grey version.